About two hours below Shibaozhai the boat reaches Wanxian, which is guarded by two nine-storeyed pagodas for good fortune. The city spreads out on both sides of the river and is known as the 'Gateway to East Sichuan'. It is situated high above the river and the foundations of the buildings are many meters high. Porters vie with each other to carry passengers' luggage up the steep stairways to the city. The winding streets vary in level from 29 to 206 meters (95 to 675 feet), so bicycles are a rare sight. Wanxian has a number of silk-weaving and spinning factories supported by intense silkworm cultivation--operated on a family basis--which continues year round in Wanxian County. Other light industries include tea, bamboo and cane goods, cotton clothing, leather and Chinese medicines. Paper mills utilizing wheat and rice straw from the countryside disgorge milky waste into the Yangtze, adding to the pollution. Of the three major regions affected by the proposed Three Gorges Dam, (Yichang, Wanxian and Chongqing), Wanxian lose the most. Two-thirds of the total of 1.2 million people to be relocated live in the Wanxian prefecture and the reservoir will inundate two-thirds of the city. Over 900 factories are located below the new waterline, and many have already been replaced on higher ground. History of Wanxian: The city received its present name during the Ming dynasty (1368--1644), and became a foreign treaty port in 1902. In 1926 two British gunboats bombarded the city, causing massive fires, when the local warlord took to commandeering foreign vessels for the transport of his troops. Following this incident, a boycott on the loading and unloading of British vessels was enforced for several years. This became known as the Wanxian Incident. As the halfway city between Yichang and Chongqing, Wanxian was a main port for East Sichuan merchandise (including large quantities of hung oil, used in treating wooden junks). Early travelers commented on the huge number of junks anchored at Wanxian. Junks also used to be built here from cypress wood found in the nearby hills. 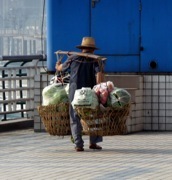 What to see in Wanxian: Every night of the year the famous Wanxian rattan and cane market is held on Shengli Lu. Buyers and sellers mingle in a frenzy of bargaining for handmade summer bed mats, fans, hats, straw shoes, furniture and basketry. 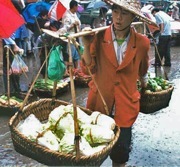 Small, round, red- trimmed baskets with lids are the most popular item and are well known throughout China. Roadside stalls trade in spicy noodles and cooling, opaque soybean jelly and fresh fruit. In the mornings, just a little further west of the night market area, one of the city's ten free markets sells local produce and seasonal delicacies such as mountain mushrooms or live eels. Second Street (Er Malu) is the main shopping thoroughfare. In l983 a small workshop was set up, employing two teenage boys and a few part- time workers to paint and varnish river stones from the Three Gorges and from the Daning River's Three Little Gorges. These make attractive mementoes and can be bought at the Arts and Crafts Store, 1 Third Street (San Malu). Visitors may also visit silk-weaving and cane-furniture factories. 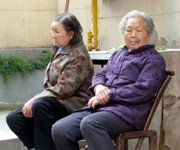 Wanxian: two old women On our way to visit a local family, we saw a class of young children exercising in the street. We visited a couple that had been removed from their homes in the countryside to make way for the rising waters of the 3 Gorges Dam. They were quite content with their forced move. When they were farmers they had no government pension, but they were offered compensation for losing their homes, and if they moved to a city, a guaranteed government pension. They continue their love of planting in the outside communal garden. They had a tiny, but adequate, kitchen. Bai hanging burial model Back on the Princess Sheena, Arthur went on a tour of the ship's bridge. On the river that afternoon we saw a lot of terraced fields. Each year new fields are carved out of the higher slopes to prepare for the future rise in the reservoir that will be created here. Qu Yi gave us a long talk about her family and their experiences. She comes from the northern Manchurian area of China, but has special dispensation to live and work in Beijing, since her husband is a Beijinger. Qu Yi's grandparents had an arranged marriage when they were both 14. Her grandfather's family was richer and more importantly placed than her grandmother's family, and as a result, her grandmother was treated more like a servant than a wife and mother. They had 9 children. Qu Yi's grandfather was a medical doctor. In 1952 both her grandmother and grandfather were in the People's Republic army. Qu Yi's grandmother died at age 76. Her grandfather is still alive at 85. 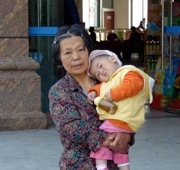 When Qu Yi was little, food was severely rationed. Her grandmother was always the last to get anything to eat at all. In 1941-1949 the Chinese were at war resisting the Japanese. Then they had the civil war. Many of the men died. The remaining ones were helped to find brides by the army. Usually the girls were pretty, young, and well-educated. The men were older, farmer-soldiers, and poorly educated. The girls had no voice in the matter. Qu Yi's in-laws had such an army-arranged marriage, but her mother in law was lucky, because his family was quite rich, from Shanghai, and he was well educated. He even spoke English and was sent to work in the new Chinese embassies in Greece and Germany. He was still single at age 35. Qu Yi's mother in law had just graduated from university and was working in foreign service. They fell in love after marriage, and they have a happy marriage. A couple of years after they were married the Cultural Revolution started. Qu Yi's father in law was suspected of spying because he was British-school educated and his family had been well off. He was imprisoned. His wife was told to divorce him or be sent with her children to the countryside. She was a heroine and refused to divorce him, because if she did, he would have no hope at all. 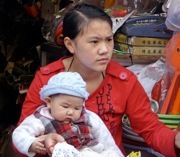 Qu Yi's husband was then 8 months old and went to live with his maternal grandmother in Chongqing. His 3.5 year old sister and his mother were sent to the country, and their new village people were told that they were the wife and child of a spy. They were very badly treated, and their health was badly damaged. 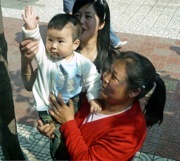 Qu Yi's husband's sister and her husband and child emigrated to the United States to Boston. They first went to Japan where Qu Yi's sister in law got a masters degree. People from the older generation never want to talk about their lives during the Cultural Revolution. They don't trust that their words won't bring them terrible trouble. Beijing: _, _, _, father-in-law, husband, son, mother-in-law, Qu Yi That night the crew and some fellow passengers gave a Farewell Talent Show. Gene Coupe's ballet was the hit of the evening, although Gene Craig and Arthur Luehrmann were pretty impressive swinging their balls to move potatoes across the floor!